According to the Brewers Association, over 5,300 breweries operating during 2016, small and independent craft brewers represent 12.3 percent market share by volume of the overall beer industry. In 2016, craft brewers produced 24.6 million barrels, and saw a 6 percent rise in volume on a comparable base and a 10 percent increase in retail dollar value. Retail dollar value was estimated at $23.5 billion, representing 21.9 percent market share. By adding 1.4 million barrels, craft brewer growth outpaced the 1.2 million barrels lost from the craft segment, based on purchases by large brewing companies. Microbreweries and brewpubs delivered 90 percent of the craft brewer growth. 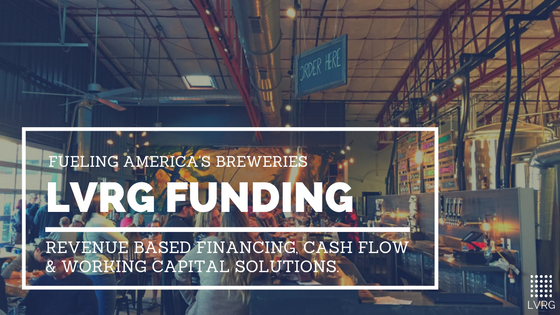 Expanding your brewery, adding on a taproom, purchasing brewery equipment, and evening out cash flow can all be managed with the right type of brewery financing. Can you bank on bank financing? Not nowadays. Bank loans do not provide the short-term influx of cash flow necessary to sustain and grow craft breweries; not to mention, they're near impossible to obtain. LVRG is the Nation's go-to source for brewery financing and provides opportunity capital to brewery owners nationwide. Call us today at (855) 998-LVRG or click below! Have an SBA Loan, Although Need Additional Capital to Fuel Your Craft Brewery, Brewpub, or Taproom? Don't let poor credit hold you back from growing your brewery. LVRG provides brewery financing options regardless of credit! Brewery Financing & Craft Brewery Loans. LVRG Provides Opportunity Capital to Brewery Owners Nationwide!